A few years ago, Eric's Grandmother gave me a Norwegian Troll that she had kept in her house for a long time. 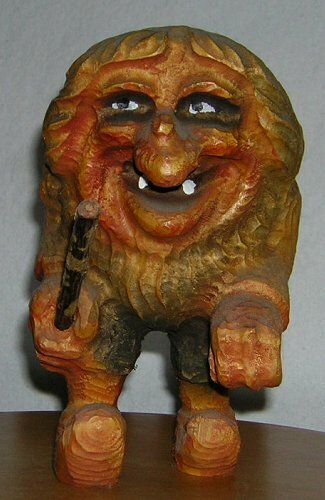 It is a hand-carved troll, bought on a trip to Norway many many years ago. This troll was kept on a shelf, and apparently scared little Eric enough that whenever he would visit he would sneak up and turn it around. Grandma Helen would later discover the troll facing the wall instead of the room. She never caught little Eric turning the troll around. Flash forward to when Grandma put the troll, secretly, into my keeping. She asked only that I make sure I put it in a place that was very obvious and let her know what happened when Eric noticed it. I put it on the stove in the living room, the closest thing we have to a mantle, and waited. It took him a little while to notice, but when he did I was lucky enough to catch every bit of his reaction. His eyes got wide, his hand shook as he pointed at the troll and said, "HOW DID THAT GET IN MY HOUSE!!!???!!!" Oh, indeed, every bit as classic a reaction as grandma had been hoping for! After a few years Eric became used to the presence of the Troll in the house. So it was time for a new adventure. We dubbed the Troll with a name and packed him up and brought him on a road trip. Some time later we took him to a convention and got pictures with celebrities. This turned out to be popular, and led to more celebrity pictures, mostly in the realm of comic books and genre TV. This website is the pictorial chronicle of Torvald the Troll's adventures on the road, to be added to as we take him to new places and meet new people. He's a family heirloom, now, as well as a celebrity on his own terms. You can see Torvald's roommate on his first trip in this blog entry. Watch Bloggity-Blog-Blog-Blog for news of updates.